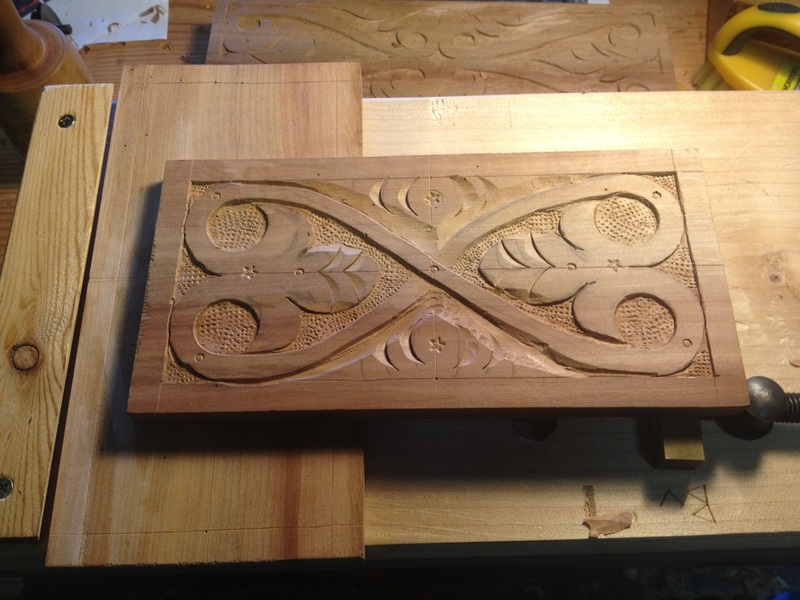 A little more carving done this weekend, in two different snatches of time in the garage. 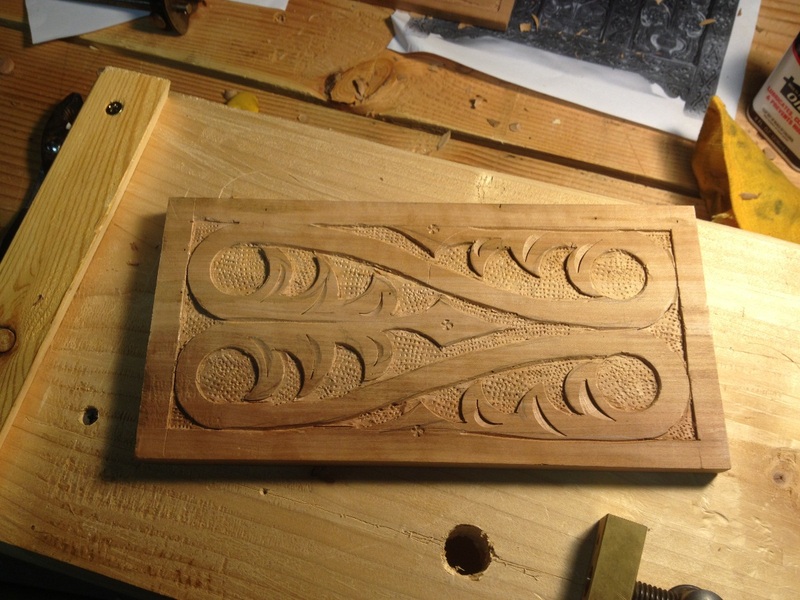 These two panels are going to be the sides of the box I started carving last week. 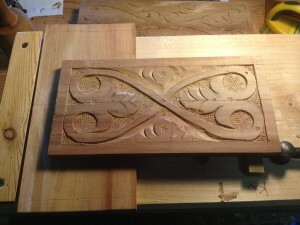 The front can been seen in a previous post on S Scroll carving step by step. I’m playing around with different layout choices for these sides, trying to get more practice and experimenting with different ideas as I go. The first side I was experimenting with simply stretching the S out a bit to fit the shape, as well as putting the center circle or button in the same plane line rather than offsetting them a little. Overall I’m not sure about this one, something seems a little “Off” about it, but I can’t really put my finger on it. The second side I tried a new trick with crossing the S shapes in the center, which visually fills the space a little more pleasingly to my eye. I did struggle a little with some grain tear out as I tried something new to me in the top and bottom spaces. I need a lot more practice to get some of these muscle memories established. Over all I can feel myself getting a little more comfortable with chisels, and the body motions on each panel. This is sort of the point of this box project, practicing and developing my skills in this area. That and trying different designs and layouts to see what I enjoy carving, and what looks good. Next up is the back panel, which I’m going to layout in pencil this evening. I’m probably going to try the front design again, but I might change my mind. Yeah, I too was excited about these original episodes finally becoming available. My wife bought the first 4 seasons for me as a xmas gift. A week after opening shop woodworking sent me an email that the first five seasons would be offered as a bundle deal. Ha, I was pretty upset that they would go and offer a discount immediately after so many of us had already purchased these individually. I requested they send me the 5th season no charge, since I’d already paid much more than the discount price they offered just for the first 4 seasons. What a deal. I don’t understand why they don’t just offer up the entire set for a major discount price for those of us who are going after the complete set. UNCtv is offering free viewing of the past 6-7 seasons of the Woodwrights shop. I don’t mind paying for this valuable resource, but I have a hard time spending 29.99 for 30 of those dvd’s. Still, I might. Roy and his legacy is a national treasure. I’m just wanting them to release them faster!